Teens on the Green line. 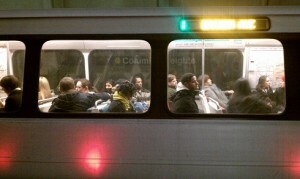 Teens + Metro = Trouble? Many people assume that “equation” is true, and this story, One-Quarter Of Those Arrested On Metro Are Younger Than 20, from WAMU’s Kavitha Cardoza substantiates the link between young transit users and crime. Metro Transit Police Chief Michael Taborn says there’s been a spike in crime committed by youth on Metrorail and Metrobuses; last year they made up a little more than 500 of the approximately 2,000 arrests. And Taborn says many of the 90 assaults on bus operators involved youth. When Taborn says “assault” he means that metrobus drivers have been on the receiving end of punches, flung objects or saliva. Taborn also confirms that the trend of recording altercations and uploading them to sites like YouTube inspires copycat crimes. Taborn says over the past five years, more students attend schools that aren’t in their neighborhood, whether it’s to attend charter schools or because their neighborhood school has closed down. And that increases the opportunities for students to meet others from rival schools and crews. Twenty thousand students use the Metro system every day. I’ve only witnessed one incident where rowdy teens were confronted by a Metro employee, but it was memorable. I wish they had school buses for these kids. People just want to commute to work/home/wherever they’re going without having to deal with the rowdiness and nonsense.